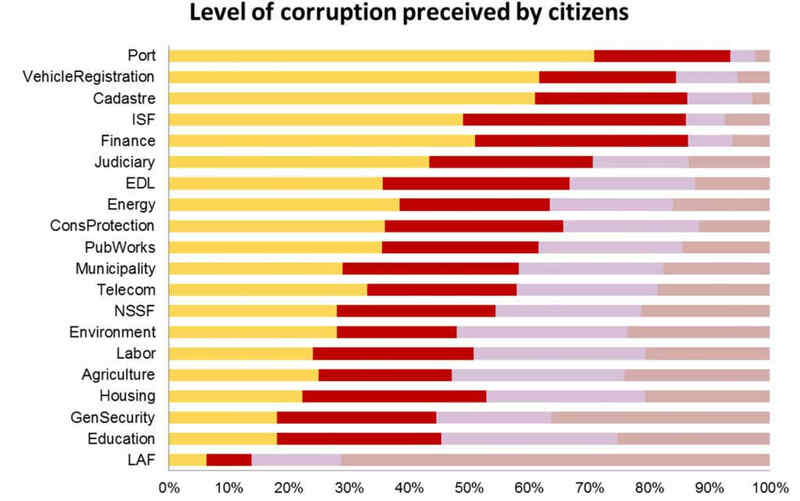 How Corrupt Are The Lebanese? – 25% of the population would certainly compromise on values and principles to reach material objectives. – 38% of the population would go around a queue. – Youth are more willing to make compromising choices than older generations. – 30% of those aged 55 and above admit that they would seek outside interference against a police officer doing his job. – 62% of those aged 18 to 24 would call for interference against a law enforcement officer on duty. – 38% of the higher income level respondents say they will sure bribe to get a public servant’s signature to avoid delay (vs 16% of lowest income level). – Only 14% of the population fully trusts the judiciary. When asked why, 64% of the respondents mentioned spontaneously political interference, and 49% mentioned corruption. – 93% of the respondents consider corruption widespread at the port and 86% in the cadaster. – The least corrupt institution is the Lebanese Army. – Public opinion locates corruption in Port, Vehicle Registration, Cadaster, Ministry of Finance and the legal sector as top targets. All in all, half the citizens are willing to report corruption, as long as it does not backfire on them, and as long as it leads to results. I think the most worrying figure is the fact that the younger generation is more willing to compromise on its principles. It is our duty to report bribes and put an end to corruption and Sakker el Dekkene is providing a platform to do so. Check out their [website] and make good use of it. how about the Lebanese Army? it’s not corrupted? i highly doubt it!